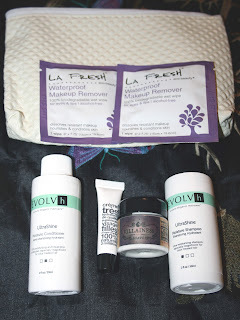 Hi ladies..quick post about the September Glymm bag. 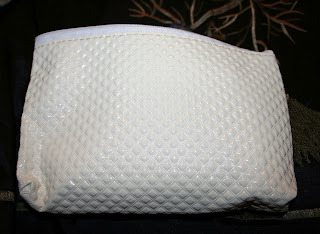 It came in another one of these granny bags in a creme colour this time. It felt a bit heavier, so I was expecting something a little better. 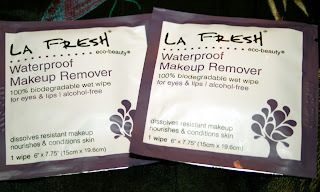 Inside were two La Fresh waterproof makeup remover pads. 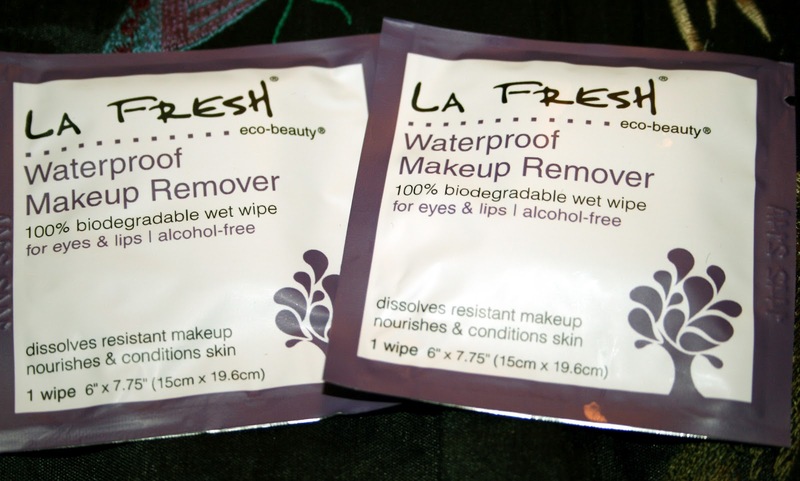 I used 2 different types of La Fresh makeup remover wipes and haven't really liked it. We'll see how these are. Full size is 18 packets for $9.99. Sample size 2 packets is worth $1.11. Full size is 30mL for $19.00. Sample size is 3mL worth $1.90. Next is the EVOLVh UltraShine Moisture Shampoo for colour treated hair. It's a luxury organic haircare brand. We'll see how well it does. I always love sampling different shampoos because of my crazy hair. I'm always looking for the next best thing. The positive to this sample it is a nice size to get a good feel for it! Full size is 250mL for $24.00. 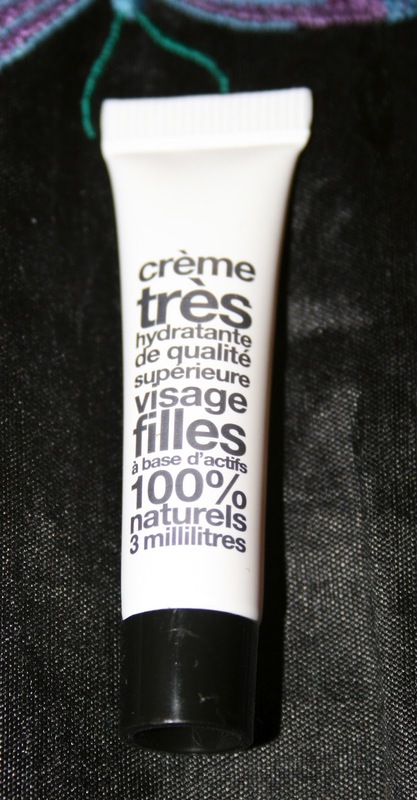 Sample size is 59mL worth $5.66. Next is the EVOLVh UltraShine Moisture Conditioner for colour treated hair. It's the sister product to the shampoo. I always appreciate when beauty boxes have the foresight to send you the matching shampoo and conditioner, because most of us like to use the same brand for both. Full size is 250mL for $25.00. 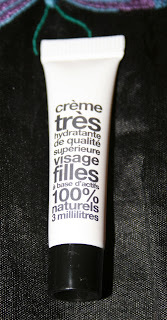 Sample size is 59mL worth $5.90. Finally, the best part of the whole box was the Villainess Dulce En Fuego Whipped Warming Body Cream. This smells absolutely amazing. It smells so good I wanna eat it with a spoon! It has a sugary vanilla scent to it that is DIVINE. I think I am going to end up purchasing the set HERE. Full size is 170g for $15.75. Sample size ? It's small probably worth $1.50-$2.00. This is everything. As you can see, not that exciting... a little boring. 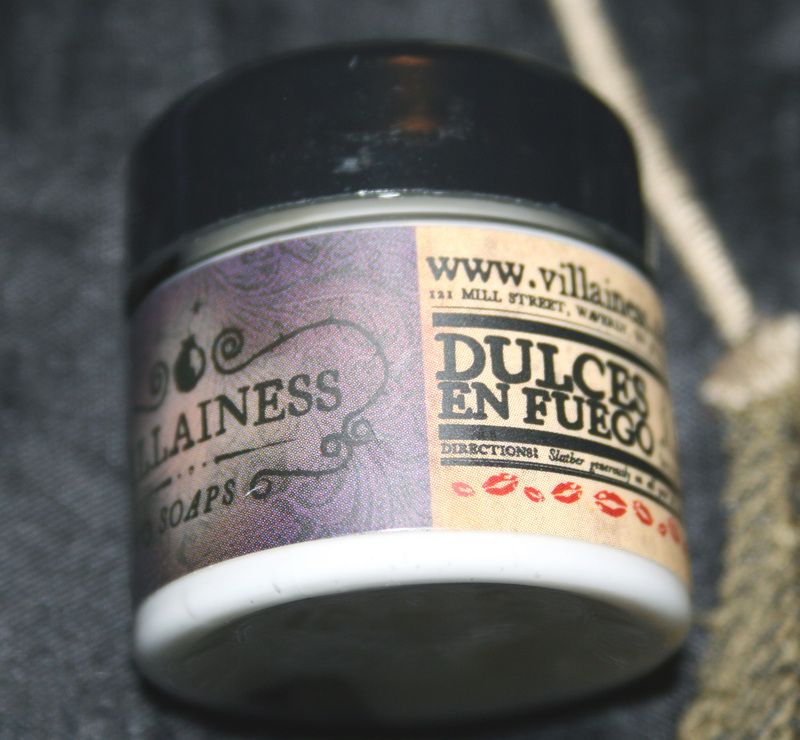 The Villainess cream by far the most exciting product. The total value of this Glymm bag is approximately $16.70. I pay $11.20 with taxes. They are consistently at around the value you pay. My subscription is $10 a month, but if you sub now they are $12 a month. Tomorrow is Canadian Thanksgiving. I hope you all feel blessed and have a wonderful holiday with your family and friends! Happy Thanksgiving! I think I'm going to end up purchasing as well. I have over 200 glymm points. The decent Glymm points is pretty much the best part of still subbing.